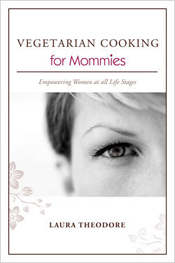 VEGETARIAN COOKING for Mommies is an aesthetically pleasing book, as you can tell by the cover, by Laura Theodore, the Jazzy Vegetarian. The focus of this vegetarian cookbook is making fruits and vegetables the “star” of your meals. Whether a dedicated vegan or serving an occasional vegetarian meal, this book offers over 60 healthy and delicious alternatives to “store bought” fare. There are so many reasons that women (and men) should be vegetarian or eat a mostly vegetarian diet (I admire those folks who practice animal husbandry, as I could never butcher an animal and eat it). From the environmental impact of cutting meat from your diet to the health benefits, VEGETARIAN COOKING for Mommies makes it easy to go veggie. As a working mom, both in and outside of the home, I need quick recipes during the work week. We also need to try new vegetarian recipes, as we get in a rut of always eating the same things. One of my favorite recipes in VEGETARIAN COOKING for Mommies is the Quinoa Breakfast Porridge. My kids love hot cereals, and I love quinoa! Place all ingredients (except topping) into a medium saucepan. Place on medium heat and bring to a boil. When boiling, reduce heat to low and simmer about 15 minutes, or until all liquid is absorbed and quinoa is soft but not mushy. Stir mixture a bit and remove from heat. Sprinkle top evenly with brown sugar and cinnamon. Cover and let set for about 3 minutes, until the sugar melts into porridge. Serve with soy, rice, almond, or dairy milk (just as you would oatmeal) and a bit more brown sugar (as desired). We always cook quinoa as sort of a quick cooking rice substitute, and I have never thought of using it as a grain in a sweet cereal. Thanks to the Jazzy Vegetarian’s cookbook VEGETARIAN COOKING for Mommies, we are broadening our vegetarian diet, although, I must say, this cookbook is good for daddies too! Thanks Jennifer for this post, I have been looking for a vegetarian cookbook that caters to the busier lifestyle of being a parent. I am definitely going to check this book out. Thanks for this! I can’t wait to try out some of these recipes. Does this book contain dieter-friendly recipes? Crimson Wife, I believe they are all dieter friendly recipes, although they are not delineated as such. Thanks! I had to ask because some vegetarian cookbooks I’ve seen are definitely NOT dieter-friendly. Meat-free does not always mean it’s healthy.